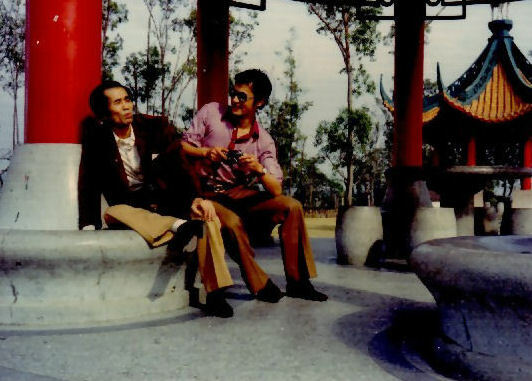 In a previous article, I wrote about meeting Tomoji Miyamoto during a visit to Beijing. Miyamoto was Egami Sensei's assistant and also Chief Secretary of Shotokai until Egami Sensei's death in 1981. Mr. Miyamoto has a law degree from Chuo University and is a professor in the Physical Education department of his alma mater. 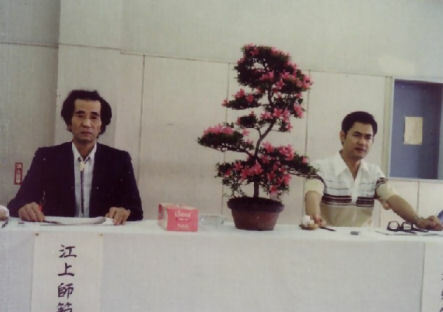 Mr. Miyamoto helped Egami Sensei publish his book The Way of Karate: Beyond Technique (Kodansha 1976), one of the most important books for practitioners of Shotokan Karate. During a recent visit to Beijing, I spoke with Mr. Miyamoto about the publishing of Egami Sensei's book, The Way of Karate: Beyond Technique. In addition to discussion about Egami Sensei's book, our conversation led into several areas about practice and Mr. Miyamoto's relationship to the Shotokai. Set out below is my translation of some of that interview. When did you first start to practice karate ? I first started to practice karate when I entered Chuo University in Tokyo in 1965. I was 18 at the time. When did you first meet Egami Sensei ? I first met Egami Sensei at Summer Gasshuku during my first year. As first year students, in addition to practicing, we also were responsible for preparing meals and taking care of the senior members. There were about 100 members at Gasshuku, 50 of whom were new white belts. Because we were new members , we were not instructed directly by Egami Sensei. On the third day of Gasshuku , we went to a large gymnasium , which is where I first saw Egami Sensei, who was seated on a large stage at the front of the gymnasium from which he directed Mr. Isayama to lead practice. At the end of practice , Egami Sensei gave his comments on practice. Seniors like Takagi Jotaro, who is now leader of the Shotokai , and Aoki Hiroyuki, who later left the Shotokai to form Shintaido, would often act as Goreisha, leading practice under Egami Sensei's direction. Egami Sensei published a book in Japanese before he published The Way of Karate : Beyond Technique , so why was there a need for a second book ? 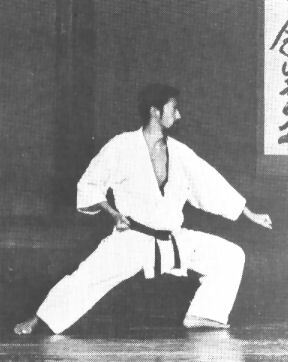 There is a book called Karate Do for the Specialist (Rakutenkai 1970), which was published in Japanese and bears Egami Sensei's name , but that book contained a limited amount of Egami Sensei's ideas about karate practice. That book was published by Mr. Aoki , who was the leader of Rakutenkai. Can you tell me about Rakutenkai ? In 1965 Master Egami asked Mr. Aoki to form a group to research new methods of practicing karate that would not be restricted by the traditions of the Shotokai. This group would practice several times a week in Nogeyama Park in Yokohama from 11:00 p.m. to 4:00 a.m. I attended several of their practices, but when I realized their practice was going in a different direction from Egami Sensei's, I stopped attending and continued to practice with Egami Sensei. Later Rakutenkai became Shintaido, and they left the Shotokai. Can you tell me more about the book Karate Do for the Specialist ? Master Egami wrote the manuscript for the book, but Rakutenkai did the kata photos. The book was a limited edition of 1000 copies; it contained about forty kata, including several Bo kata. Egami Sensei and Mr. Aoki disagreed on the content of the book and eventually Egami Sensei told Mr. Aoki, "You're free to do what you want with the rest of the book." As a result the book became Mr. Aoki's book with Egami Sensei's name on it. Is this why the second book came about ? Yes. I felt that there should be a book that everyone could afford, and which explained clearly what changes had come about in technique and what Egami Sensei felt about practice. At that time, Egami Sensei wrote articles which were published in the Shotokai newsletter four times a year. I felt that these articles could be the basis for a book, so I took them to my friend Mr. Kenji Suzuki, who was in charge of the International section at Kodansha publishers. He agreed that these articles could form the basis of a book. Was Egami Sensei still actively teaching at this time ? Yes, Egami Sensei was teaching, but it was very difficult for junior members to get to practice with him and spend time learning from him. That is why I felt a book would be very helpful. Furthermore, Egami Sensei was in poor health, so I wanted him to record his ideas for future generations. You appear in most of the photographs in Karate: Beyond Technique . Did you take these photographs over several weeks or several months ? We took the photographs in one day. We went to Kodansha Dojo, the same dojo at which many of the photos in Karate Do Kyohan were taken, early in the morning and worked until the photos were complete. I was unhappy with many of the photographs, but we were on a limited budget, so most photos were done in one take. When the manuscript was complete did you help Egami Sensei to edit it ? No. Egami Sensei edited the book himself. I was quite young at the time and felt the book should be written in a more formal manner, but Egami Sensei's style was to write as if he were talking to someone about practice. Looking back on it, I'm glad I did not speak to Egami Sensei about this issue, because I feel this is the bible of his teachings and truly reflects his ideas. I still refer to this book often and have reread it many many times. Each time I reread the book, I find new things. It is one of the books I brought with me to China. Why was The Way of Karate: Beyond Technique published in English first and then in Japanese ? My friend Mr.Suzuki at Kodansha, suggested we publish it in English first. We had a professional translator at Kodansha translate the text and then sent a copy to Ohshima Sensei for his suggestions. Egami Sensei was really close to Ohshima Sensei and wanted to have him review the text and also to write the forward to the book. Yes. For many years the Shotokai wanted to republish this book, but since I had quit the Shotokai they did not want to use my photographs in the book. Mr. Suzuki at Kodansha refused to republish the book unless it remained unchanged. After Mr. Suzuki retired, Kodansha agreed to republish the book with new photographs. I notice that the forward to The Heart of Karate -Do is now written by Jotaro Takagi, President of the Shotokai, and Ohshima Sensei's forward to the original book is now called "A Note from America". I don't know why they changed it. It was Egami Sensei who asked Ohshima Sensei to write the forward. Why did you quit the Shotokai ? About a year after Egami Sensei's death, I quit the Shotokai. I felt that things had changed at the Shotokai and that they were not proceeding as Egami Sensei wanted them to. Mr. Hironishi, who had been Egami Sensei's friend and associate for many years, was now the most senior member of the Shotokai, and under his influence things began to change. They offered me a position to stay on, but I felt there were conditions, so I left. I still have many good friends in Shotokai, but I do not regret leaving. Looking back on the sixteen years you practiced with Egami Sensei, what are some of the things that you remember most vividly ? Egami Sensei was constantly telling us, "Relax, relax take the power out of your shoulders". I bet you have heard that from Ohshima Sensei. Mostly I remember how the last two or three years before Egami Sensei died, even though he was physically weak and did not have much energy, he could still handle my attack with little effort. I was about 30 years old at the time, in top physical condition, but when I attacked Egami Sensei he would send me flying across the room with no effort--he would hardly touch me. It reminded me of when he practiced Toate with Mr. Aoki when I was a beginner. Egami Sensei would repel Mr. Aoki's attack without physically touching him. Do you think Egami Sensei had ESP ? Yes. Many times I would arrive at his house unannounced and he would be waiting for me, or Egami Sensei would tell me that someone would be coming soon. Suddenly there would be a knock at the door and that person would be standing there. It is not unusual for people of Egami Sensei's martial arts level to possess such ability. I also believe he had hypnotic power which he used to control his opponents. Do you think this was a gift, or did Egami Sensei develop this power through Karate practice? I think it was a combination. Egami Sensei always insisted that you could develop these mental powers through karate practice. Did Egami Sensei ever talk to you about the period when he was a teacher at Nakano Special Forces School during the war? Egami Sensei did not like to talk about his time at Nakano. Egami Sensei was in charge of martial arts training for the Japanese Military, but only because he was ordered by the Japanese government along with several other leading martial artists to go there to teach. Egami Sensei felt that what he was doing there was not Japanese Budo. I think he stayed for about one year. Do you plan to write a book about your experiences here in China ? I have not thought about a book, but I submit reports to my University, so I will have all of the documentation if I decide to do that. Thank you for sharing your experiences with me.